Give Me My Remote > Are You Smarter Than a 5th Grader? > Fox Revives ARE YOU SMARTER THAN A 5th GRADER? Fox Revives ARE YOU SMARTER THAN A 5th GRADER? 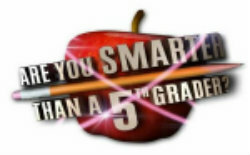 Fox is bringing back ARE YOU SMARTER THAN A 5th GRADER, the network announced. (The series bowed on Fox in 2007 and ran for three seasons, before shifting to a syndicated run.) Additionally, Jeff Foxworthy will return as the show’s host. For those who missed the show during its first run, the premise is simple: questions comprised of information found in real 1st-5th grade text books are posed to adults, to see how much they’ve forgotten since they were in school. And real students were brought in to potentially help the adults figure out the answers. Fox has yet to set a date for ARE YOU SMARTER THAN A 5th GRADER’s return. Are you excited about the revival? Filed under Are You Smarter Than a 5th Grader? Comments Off on Fox Revives ARE YOU SMARTER THAN A 5th GRADER?